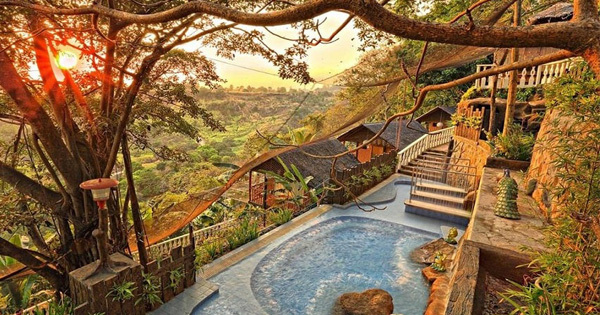 Beautiful Luxury Resorts in Antipolo, Rizal With Amazing Views -- Here Are 6 of Them! Antipolo, the capital city of the Rizal province in the Philippines, is a popular destination just a few kilometers away from the capital city of Manila. Depending on traffic, it can be reached within only about one to two hours from the metro. Despite that, it offers a much different ambiance with fresher air, lush green sceneries, and ultimate relaxation in some of the best hotels and resorts in the area. #1 - Luljetta's Place Garden Suites: Leave all your worries behind once you enter Luljetta's Place Garden Suites which is located inside the Loreland Farm Resort. It offers health and wellness services from a Hanging Gardens Spa and jacuzzi to fish spa pool and lap pool as well as the tropical-inspired rooms. Even the picturesque views of the mountains and landscapes would put your mind at ease. #2 - Loreland Farm Resort: From being a private rest house with mango plantation, Loreland Farm Resort has become one of the highly-acclaimed resort in Antipolo. The 8-hectare land area combines over 50 rooms accommodations, five function rooms, one restaurant, and five swimming pools. It also houses the Luljetta's Place Garden Suites and Camp Tipolo Adventureland but may require a separate entrance fee. #3 - Date and Dine Resort: Tucked away in a residential area, feel at home at Date and Dine Resort which offers accommodation as hotel standard at a relatively affordable price. Located near the Pinto Art Museum, this relaxed hotel is somewhat an art in itself with themed rooms such as the safari, Indian, zen, and rustic rooms. The poolside restaurant serves great Italian dishes and they also have barbecue grill facilities. #4 - Cristina Villas Mountain Resort: What used to be a private family retreat house in the 1960s emerged as one of the pioneer resorts in Antipolo in the 1980s. The homey vibe is still alive throughout the 2.5-hectare area atop a mountain with its serene and relaxing ambiance amidst the cool breeze and overlooking Bataan and Laguna De Bay. It also features room accommodations, an outdoor pool with waterslide, a zip line, restaurant, among others. #5 - LeBlanc Hotel and Resort: Strategically located near the key spots in the city such as Hinulugang Taktak Falls and the public market, LeBlanc Hotel and Resort is an ideal destination for those who are looking for a place to stay. Their in-house restaurant is known for some of the best Filipino and Asian cuisines in the city. It is also an ideal venue for different occasions which can be held in any of the 9 function rooms of the hotel. #6 - Villa Elisha: Also known as "a forest hideaway," Villa Elisha is a vacation house tucked into the woods of Phillip's Sanctuary Eco-resort. It is the perfect place for families and barkadas who want privacy and exclusivity in a close-to-nature way. The whole house which features modern architectural design could be rented with three bedrooms that has an en-suite bathroom each.